Cebu Pacific announces its latest airfare sale, “Heaven Cent”, which slashes down base fares to Php 0.88 to selected domestic destinations. Travel period is January 1 to March 31, 2012. 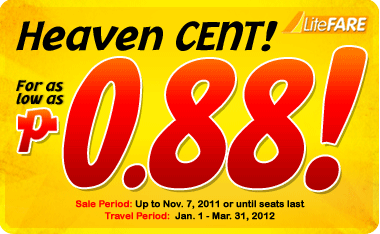 Current sale highlights trips to and from Cebu, plus the new trip from Cagayan de Oro to Iloilo. Check details below. Seat sale is up until November 7 or until ticket lasts.